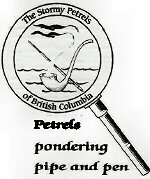 The Stormy Petrels will gather for their “Master’s Dinner” in this, their Silver Jubilee year, on March 17th. The dinner, as in the past, will be enjoyed at the Bessborough Armoury (2025 West 11th Street, Vancouver), an Art Deco style heritage building constructed in 1932. Please be there at 6:00 for 7:00. Entertainment guaranteed. Victorian dress is encouraged. It is also not too late to let Fran know if you wish to propose a toast. Please RSVP to Elsa as soon as possible, if you have not already done so. Thanks to Mr. Eric Swanick, head of special collections at SFU Burnaby Campus, there will be a dedication of the Sir Arthur Conan Doyle/Sherlock Holmes collection. Admission is free, but seating is limited, so please call or e-mail the library to book your spot. There will be speakers, and a reception to follow. Find out how this all came about and where the books came from. The Stormy Petrels have been very enthusiastic about this since the idea was first brought to light, and are very excited to see it all come together. Please call 778-782-6704 or e-mail library@sfu.ca before March 16th. MARVELOUS MARCH – Mark your calendars!